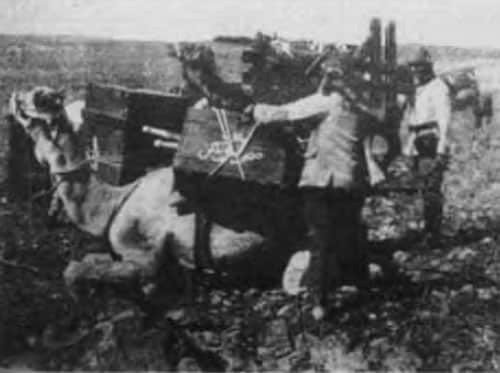 Turkish Army camel transport in Mesopotamia. No beast of burden could operate as effectively in the desert as a single-humped dromedary or Arabian camel. Mesopotamia: Maude attacks Hai salient southwest of Kut on a mile front with 13th Division (1,135 casualties including 3 battalion commander, 2 Victoria Cross) and 114 guns; only half captured trenches held against counter-attacks. Verdun: German success at Hill 304; mile-long stretch of French trenches stormed, but French regain most of them on January 26. Atlantic: White Star liner and AMC Laurentic (350 killed) mined off Ireland, her gold cargo partially salvaged after Armistice. North Sea: German destroyer raid on Southwold, Suffolk. Austria: ­Grand Admiral Haus argues to Emperor Charles for unre­stricted U-boat war. Charles then sees German Admiral Holzendorff (which promises 42 U-boats in Mediterranean) and Zimmermann.